The ARsandbox combines an actual sandbox with a 3D camera, a digital projector and a computer to display a topographic map that adjusts as sand is moved around inside the box. The University of California, Davis recently brought an augmented reality (AR) sandbox to students at Howard University Middle School of Mathematics and Science to help them learn about Earth science and watersheds. The sandbox combines an actual sandbox with a 3D camera, a digital projector and a computer to display a topographic map that adjusts as sand is moved around inside the box. When users hold their hands over the sandbox, it becomes a cloud and virtual water flows from it into the sandbox. 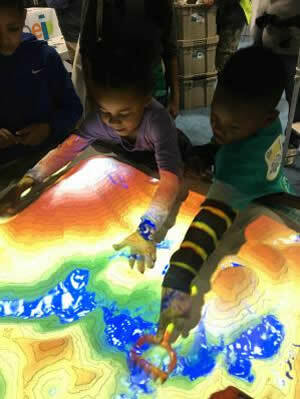 "With its hands-on, interactive technology, the augmented reality sandbox is well suited for education and outreach," said Louise Kellogg, a professor in the UC Davis Department of Earth and Planetary Sciences and director of the W.M. Keck Center for Active Visualization in the Earth Sciences, or KeckCAVES, which developed the sandbox, in a prepared statement. "We are excited to bring that to the students at Howard University Middle School." The sandbox will be housed in the grade 6 science classroom, but teachers plan to use it for instruction of students in grades 7 and 8, as well. "This sandbox will allow our students to literally play in the sand while learning," said Kathryn Procope, head of school at Howard University Middle School, in a prepared statement. "What could be more perfect? It brings the subjects of topography and geography to life for our students who are digital natives. By using their hands and technology, they will have the ability to terraform, see watershed effects on the physical earth, and understand the importance of stewardship of our natural resources. We are so excited and grateful to be selected for this project." Originally developed with funding from the National Science Foundation, at least 150 of the displays have been built around the world using the open source software. "The ARsandbox is being used in so many creative ways by people around the globe," said Geoffrey Schladow, director of the UC Davis Tahoe Environmental Research Center. "It is a challenge for our team to keep track of the growing user group and to help incorporate some of the best ideas into updates that all can share in."